From the airport you will take the short ferry ride to get to Graham Island where the Village of Queen Charlotte is located. 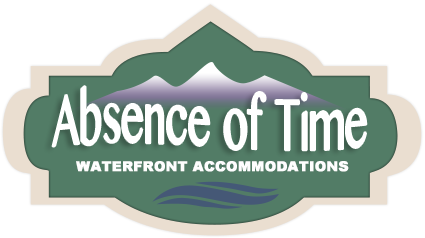 When you get off the ferry you will head south towards Queen Charlotte, it's only a couple minutes from the terminal to the Absence in Time House so keep an eye out. It will be located on the sea side of the highway and your looking for 3808 Ocean View Drive. You know you have missed it if you make it into town. From the Masset Airport you will head south towards the Village of Queen Charlotte. Along the way you have the chance to enjoy the scenery and take in some of our hidden gems such as Port Clements and Tlell. Just don't blink or you will miss them. When you get by the ferry terminal you know your almost here. It's only a couple minutes from the terminal to the Absence in Time House so keep an eye out. It will be located on the sea side of the highway and your looking for 3808 Ocean View Drive. You know you have missed it if you make it into town so just turn around and try again! When you get off the ferry you will head south towards Queen Charlotte, it's only a couple minutes from the terminal to the Absence in Time House so keep an eye out. It will be located on the sea side of the highway and your looking for 3808 Ocean View Drive. You know you have missed it if you make it into town.